In the high country beyond Pike’s Peak is the Cripple Creek Mining District, dotted with historic mine shafts, head frames, and tumbling down miners’ cabins. Not only might a visitor find a “taste” of gold fever in this historic district, but may also experience their hair rising on the back of their necks as they “bump” into one of the many ghosts that reportedly roam the area. 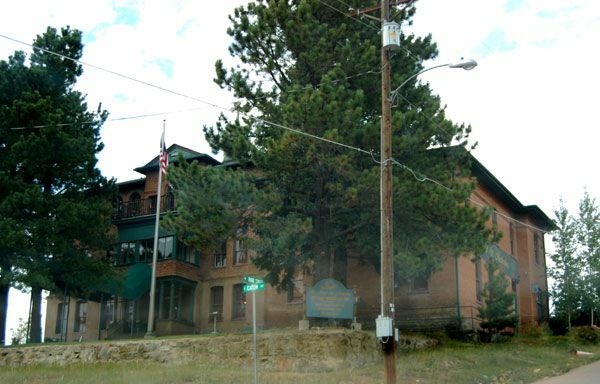 Like many other mining towns of the Old West, Cripple Creek is said to be extremely haunted. Given its rich history, complete with mining accidents, floods, fires, lawlessness, and bloody battles between mine owners and labor unions, it comes as no surprise to learn of the many ghosts who continue to linger in this once thriving city. In fact, there are so many tales of spirits wandering this historic town, that at one time boasted one homicide per day, some say it is the one of the most haunted cities in the United States. The Fairley Brothers and Lampman Building at 300 East Bennett Avenue now houses the Colorado Grande Casino and Maggie’s Restaurant. Here, you may not only enjoy a little gaming and some great food, but you might just get a glimpse of a ghost as well. At the turn of the century the three-story brick commercial building housed a variety of businesses, including a drug store, a millinery, an engineer, a lawyer and more. It’s rock-faced corner stones, recessed center entryway, and decorative molding made it one of the finest places in town for retailers to display their merchandise and offer their services. Over the years, the building also housed medical offices, a Masonic Lodge ballroom, and a mortuary. In addition to the sounds of slot machines heard throughout the building today, many have also heard the “ghost” of Maggie, who has reportedly been lingering throughout the building for decades. Usually appearing on the top two floors of the building, the sounds of her high heeled shoes are often heard echoing in the halls. Described as about 25 years old and dressed in turn-of-the-century clothing, she wears a white shirtwaist, a long cotton skirt and high-heeled boots. The young beauty, with her hair piled atop her head, is known to leave behind the scent of her rose perfume even when she isn’t spotted. Some have reported that singing and dancing is sometimes heard emanating from the old ballroom, as well as the sounds of Maggie’s lilting soprano voice heard singing an Irish accented concertina. At the casino, security guards have often reported seeing “Maggie” along with a gentleman friend playing the slot machines after hours. She has also been caught on tape by the security cameras. However, after being viewed and stowed away, the tapes mysteriously vanished. Perched atop a hill overlooking Cripple Creek is the Hotel St. Nicholas. Originally built as a hospital for the many people flooding the region in the late nineteenth century, the Sisters of Mercy opened the St. Nicholas Hospital in 1898. The building also served as lodging for the Sisters and a school for students in its early days. Over the years, the hospital served the many prospectors and families of the area and expanded to include a ward for the mentally ill. However, when Cripple Creek’s mining played out, the hospital closed its doors for the last time in the mid 1970’s. For the next two decades, the building sat empty until a series of unsuccessful business attempts were made by various owners. However, this historic building, now listed on the National Register of Historic Places, finally found its niche when it was restored and refurbished by innkeepers Noel and Denise Perran and Susan Adelbush. Today the Hotel St. Nicholas, with its panoramic view of Cripple Creek, contains 15 guest rooms, all pleasantly appointed with antiques, fine linens, and the unsurpassed elegance of yesteryear. The hotel’s Boiler Room Tavern, popular with both locals and guests, is so named because the barback is the front plate off the inn’s original coal boiler. Here, you cannot only enjoy a beverage, but also a variety Mexican food menu, and live music during some weekends. In addition to the opulence you will find at the Hotel St. Nicholas, you might also “find” a ghost or two. Said to be haunted by a number of spirits including nuns, children, and former patients of the mental ward, the most often “seen” ghostly resident is one referred to as “Stinky.” Lurking at the back staircase of the old hospital, “Stinky” makes his presence known with a sewage-like smell. The apparition of an old miner with no upper body is also sometimes seen. Another ghost, that of a little boy affectionately known as “Petey,” has been seen throughout the hotel, but most often is held responsible for stealing cigarettes and moving items about in the tavern. Quietly located just blocks from the gaming district, The Hotel St. Nicholas is can be found at 303 North Third Street in Cripple Creek. 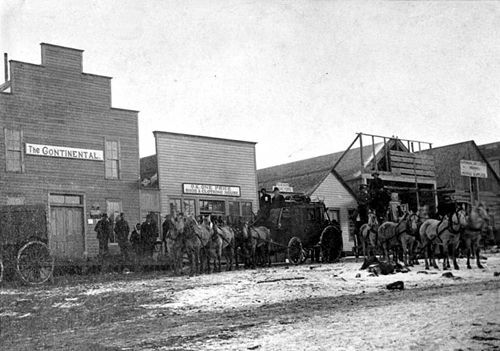 Long before Buffalo Billy’s became the casino that it is today, it was known as the Turf Club. Still, visitors can see at the top of this historic building, the carved letters spelling out “Turf Club Room 1896.” During Cripple Creek’s mining days, several exclusive “men’s clubs,” including the Turf, lined the streets of the burgeoning city. If was during this time, for reasons unknown, that the six year old spirit of a young girl took up residence in the building, and has remained there ever since. Known as “Lilly,” the friendly little girl has sometimes been seen sitting on the stairs, cradling a rag doll in her arms. Looking incredibly real, an employee once asked her if she was lost, to which Lilly replied, “No, I’m not lost, I live here.” When the employee left to get a security guard, the pair returned only to find the little girl gone. On another occasion, when a tourist was playing the slot machines, she lost track of her daughter. When she began to search, she found her perched on the staircase. Asking her daughter what she was doing, the young girl replied that she was playing with Lilly. Lilly evidently has an artistic side as her drawings, numbers, and letters are often found in the hallway at the top of the staircase. Although the walls are scrubbed down, the drawings always reappear. According to the tales, Lilly is also said to like balloons, but only in certain colors. For example, if a blue balloon is left for her, it will pop. However, if a purple balloon is left, it will begin to wander around the building on its own. Others have often seen Lilly peering from an upstairs window down to the street below. Yay my old home has been advertised in this article. Nikolai Tesla along with Linda Goodman lived in the house that everybody speaks of. My parents purchased it and made it a bed and breakfast called The Last Dollar Inn. I went to high school there and my parents sold the bed and breakfast as a turn key operation a few years after I graduated. I would never go into the Bed and Breakfast alone because of the horrible feelings I would get and the odd-ball noises. There’s a lot of history to that house and now that I’m older I would love to own it. It is easy to believe mystical events when sleeping in rooms of building materials over 100 years old as memories drift along side you as you sleep. If you wake at night but don’t move, you may hear old fire bells and wagons coming down the street. A slight beautiful lady, dressed in memories may shake on your shoulder and her voice warn you to “wake” might echo in your mind. Do you smell roses ?